It's every bride's nightmare - you plan a beautiful summer wedding but when the day itself comes, you look out of the window and instead of bright blue skies you’it's pouring down with rain! 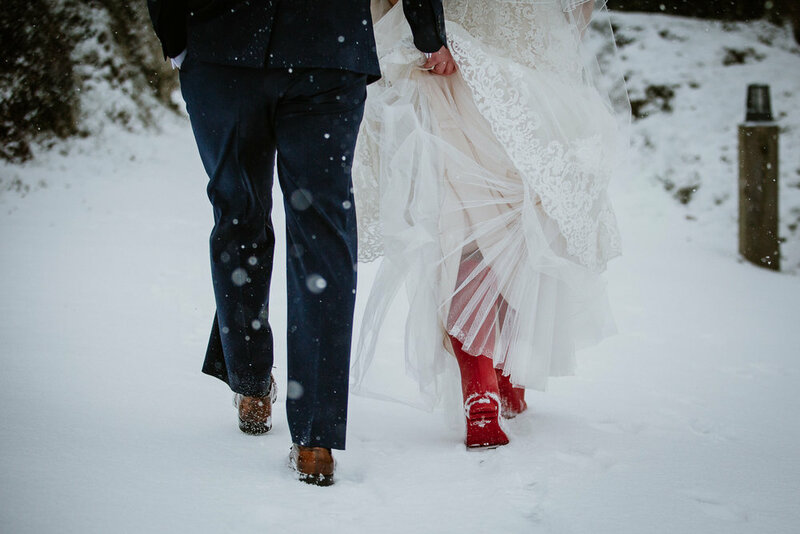 No matter how much you wish for a sunny wedding day the elements might not play their part – especially here in the UK. It can change so fast as we are so open to storms coming over from the Atlantic here. You can't control the weather, but you can control how you feel about it. So here are a few tips on how to make sure that the wet weather doesn't spoil your big day. Making your day a success all comes down to preparation and planning and that goes for the weather too. Make sure you take the possibility of rain into account. Of course, it would be lovely if your guests can play garden games and sip Champagne in the gardens of your wedding venue, but if does rain, is there somewhere else that they can go? Check with the venue and make sure they can accommodate all your guests in the case of a downpour. Regarding the garden games, there are great indoor activities for an alternative. Make sure you have plenty of umbrellas - especially for the wedding party. Some venues provide them, so it's worth asking beforehand. For the wedding couple I suggest to gor for a stylish white one as coloured umbrellas can cast a light on your faces which is not so flattering for the photos. Wellies are a good accessory to have when you venture out for some couple portraits. You can walk comfortably and don't have to worry about ruining your dainty wedding shoes. The photos always turn out more natural when you can move freely. For the rest of the guests, put the ushers in charge of rounding up a range of umbrellas to have on hand and have them hand them out to those that need them. Confirm with your vendors to see how they work on a rain day. Will the florist need to reconsider their wedding flower ideas, will the live music still be bale to perform, does the venue have an indoor ceremony alternative. The important thing to know is that you’ve hired a group of professionals who you can trust they will deliver a memorable wedding whatever the conditions. If you're having a marquee, think carefully about the flooring you choose. Coconut matting is a cheaper option but if it rains, it can be difficult to walk on, especially in heels. Wooden floors are the best even though slightly more expensive, but you'll weather-proof your venue against even the wettest of days. Here comes the fun part. Rain can produce some of the most atmospheric, romantic shots. Disappointing as the rain is the lighting is softer and can produce better images than on a bright sunny day. An experienced photographer will be able to make you pop in photos. Most photographers will sort out a wet weather plan before the big day. Maybe there is a nice door way you could stand under or there might be some woodland that is sheltered from the rain? As mentioned before, bring wellies to be able to walk comfortably. Umbrellas can be a fun prop in the photos too! Most importantly if you're having a good time it reflects in the images! Keep an eye on the forecast up and until your wedding. You may find out that it will only rain during certain times of the day. This will allow you to adjust your wedding day timings accordingly to fit your plans while taking account of the weather. Ask the caterers beforehand if they are flexible with timings. If it's showery, it might be worth moving the dinner forward half an hour so guests can be inside while it's raining and head out afterwards once it clears. Same for the photos, you can plan to have them all done before the meal, but if the weather is just better later in the day, it is worth being flexible about it and trust the photographer when is the best timing. There’s nothing better than cozying up on a rainy day. Serve favorites like hot cocoa and warm cider and set up heat lamps or fire pits to keep your guests warm and toasty. Rain can invite plenty of wind, so you and your guests will appreciate the extra blankets and towels to stay warm between activities. Rain may not be beauty’s best friend, no one likes runny mascara amd frizzy hair, but you can still look flawless on your wedding. Your hair and makeup experts will be able to waterproof your makeup and give you a trendy messy bun or similar that won’t fall apart from water and wind. So it might not be what you had envisioned for your day and it's perfectly okay to be upset about the rain, but don't let the feeling overtake you. You are the center of attention and if you stay upbeat about it so will your guests. Think about what really matters. It's not going to be a disaster if everything doesn't go completely to plan and you do end up with rain on your wedding day. This is about the two of you sharing your big day with friends and family, having a blast and not even a rainstorm can ruin that! You are getting married to the love of your life – rain or shine. Embrace and enjoy it!